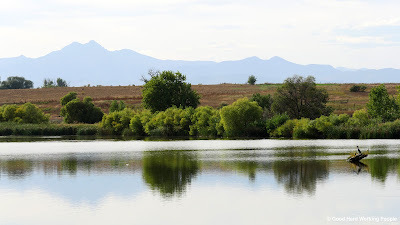 The St. Vrain State Park near Longmont, Colorado, features about ten ponds and the wonderful backdrop of the Rocky Mountains. While the Colorado state park was named after the St. Vrain River, which flows along its north side, it's not the main attraction. Actually, access to the river is a bit of a challenge. The main attraction of St. Vrain State Park are the ponds and the wildlife they support, namely birds and fish. It would be interesting to know why they changed the park's name, at some point, from Barbour Ponds to St. Vrain. St. Vrain State Park encompasses 604 acres of land and 152 acres of water (split up between the ponds and Blue Heron Reservoir). When I visited this past week, it looked like they were doing another expansion on the north-west side. Exciting! Birds commonly seen in the park are egrets, white pelicans, blue herons, migrating waterfowls and various birds of prey, including bald eagles. The St. Vrain ponds are a very popular fishing destination for a good reason. Not only are the ponds stocked with different fish, the Colorado Parks Department provides you with excellent information about which fish can be found where. I'm impressed. There are two facts about this location I purposely left out of this video: the noise of close-by Interstate 25 and the large amount of RVs. While the proximity of the interstate and the excellent amenities for RV camping make this a prime road trip camping spot, it wasn't what I wanted to feature in my nature-focused video. So from afar, St. Vrain State Park may just look like an RV park with some ponds to you - but when you get close and allow yourself to get lost in the beauty of the nature and wildlife here, it's simply a lovely oasis. Most of this video I recorded around Pelican Pond, with additional footage from Mallard Pond, Bald Eagle Pond, Coot Pond and the St. Vrain River. At Coot Pond, Scott, Whiskey and I watched the most thrilling sunset yet... I didn't include footage of that here because I'll be sharing a time-lapse video of the entire sunset with you very soon (maybe next week already). It's the first Moving Postcard published in the 4k/UHD format. While most of you probably don't have an UHD monitor yet and might not be able to enjoy how large and sharp this video can play... you will one day. It's the first Moving Postcard I edited on Adobe Premiere Pro (vs. Final Cut Pro 7). I had to switch to be able to work in 4k/UHD. Since I used Premiere Pro before FCP had become the standard a decade ago, switching hasn't been as difficult as I feared. I think I still have a lot to learn about the color correction aspect. What do you think? Do the colors and contrast look okay? Whiskey doesn't look as red-haired as usual, no? The lovely guitar playing in this video is the instrumental version of the song "Memorized" by Josh Woodward. This song is licensed under a Creative Commons Attribution 4.0 International License. Thank you again and again and again, Josh! You can look at more photos of the park (and Whiskey splashing in the water) in the In A Colorado Minute 2016 Flickr album and on my blog.